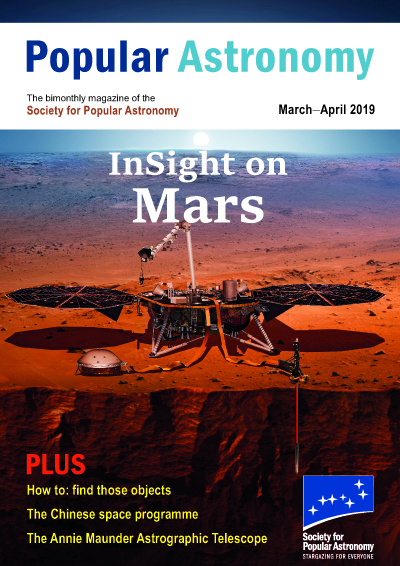 If you join the SPA, you’ll receive Popular Astronomy, our bright, informative magazine, six times a year, in January, March, May, July, September and November. Every issue is packed with articles, regular features and photos, about all aspects of astronomy, and with many pages in colour. The text is written in a clear and readable style and will appeal to beginners and more experienced amateurs alike. Here is what’s in the latest issue of Popular Astronomy. AstroNews – updates on some of the most interesting current developments in professional astronomy. Amateur Scene – a fascinating look round around local astronomical societies. Telescope Topics – practical advice on choosing and using, observing and imaging equipment. Space Exploration – latest news on space probes and missions. Young Stargazers – a special section for our younger members. Deep Sky Notes – surveying the season’s deep celestial sights. Sky Diary – what’s happening in the sky in the coming weeks. Also, readers’ letters, book and product reviews, society news, competitions and more. If you have books or other publications for review, please contact the Editor. If you would like to submit material for publication in the magazine, please read the Popular Astronomy writers’ guide.